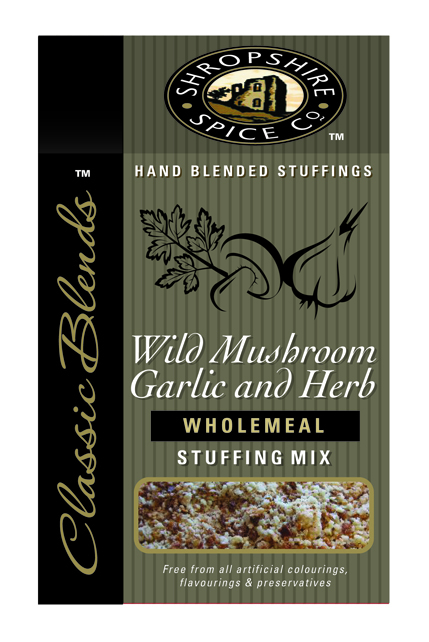 Wild Mushroom, Garlic & Herb wholemeal stuffing mix is ideal with all types of poultry, pork & game. Allergy Advice: For allergens, including cereals containing gluten, see ingredients in bold. Also, not suitable for consumers with an allergy to nuts due to manufacturing methods. 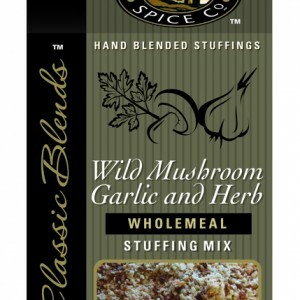 Ingredients: Wholemeal Breadcrumb (Whole Wheat Flour, Salt, Yeast), Wholemeal Rusk (Whole Wheat Flour, Salt, Yeast), Wild Mushroom, Onion Flake, Parsley, Demerara Sugar, Onion Salt, Garlic Granules, Rosemary, Mixed Herbs. The Shropshire Spice Company specialise in producing high quality products for amateur and professional chefs alike. We are perhaps best known for our Gourmet Range of stuffings. Our range of products also includes Gourmet Dips, World Spice Blends and a selection of spice mixes that compliment many drinks & dishes.